What type of Stock Broker should I use? The stock broker you use will determine the amount of money lost in brokerage fees. Trading commissions are a necessary evil that are charged by all stockbrokers. Generally, in order to buy and sell a stock you will require a brokerage firm and they all charge something for the privilege of buying or selling a stock for you. Many people still enjoy the interaction of a full service broker and a hand shake to conclude the deal. But for the rest of us, online stock trading is impersonal and demands that we place the order ourselves. Stocks can be purchased through online discount stock brokers for as low as $1 per 100 shares or up to approximately 2% of the trade through a full service broker. For instance, let's say you want to buy 500 shares of a $20 stock. The commission to buy and sell this stock would likely be between $10 if you used an online discount stock broker or up to $400 if you work with a full service broker. Let us look at the table below. It details how much you would be required to make to break even, on a percentage basis, in a year of trading. The table is broken down into different sized trading accounts. Let us see what happens for different situations. The table below shows that for a $10,000 account you would need to make 24 percent per year just to break even if you are using a full service brokerage firm, paying 2 percent per trade and trading 12 times a year. On the other hand, using an online discount broker, you would only need to have a return of 1.2% if you were paying $1 per 100 shares. 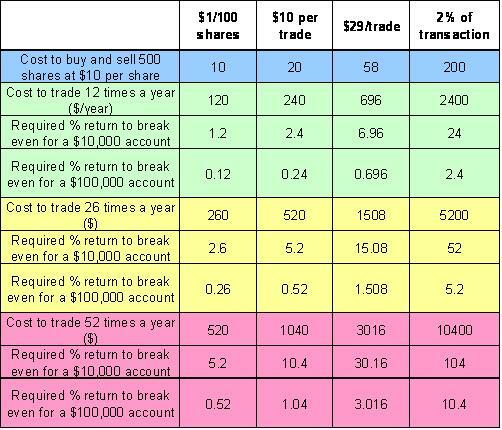 In this table, the cost of one trade covers the buying and selling of the stock. A full service broker does provide a service. Generally, the more commission you pay the more you get. In the above table, a full service broker would likely charge around 2 percent to buy or sell a stock. If you find a good broker, they should help you identify when and what to buy. They should keep you informed and educate you. For a $1 per 100 shares, you generally get a discount broker, who will carry out your transaction. You get no advice on what to buy, when to buy or when to sell. You are responsible for making the trade yourself likely on either the Internet or phone and your monthly statement will likely be either sent to your e-mail address or viewable in your account. The above table helps you understand that the more you pay to trade the less you should trade and the more of a long-term trader you need to be. To find out more about a stock brokers who serve the US, Canadian or British markets the following links will help you. 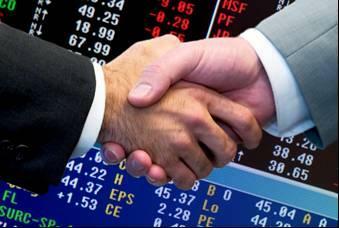 They detail reviews and surveys of various online brokerage companies. If you want to open a Canadian account, J. D. Power has completed a survey of online brokers which is located here or you can take a look at the 2009 Globe and Mail brokerage survey. Interested in opening a US account, Motley Fool and the Money Blue Book have reviews. To learn more about the types of questions you should be asking before you sign on the dotted line check out the questions we ask when looking for a stock broker.